It looks like freebies wont stop raining. Just few days back we had Bitdefender Antivirus and Fixit Utilities 10 Essentials Promos. Today we have another promo for you. Thanks Mike for informing us about that. 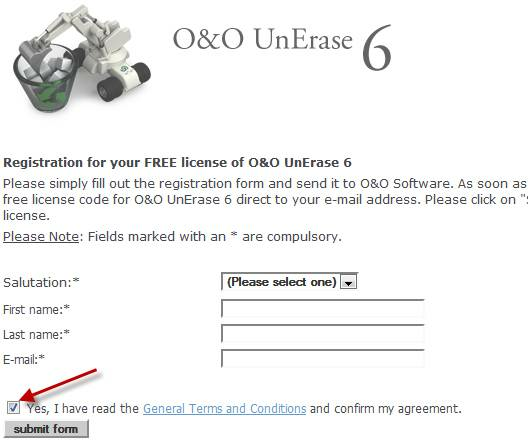 You can Grab O&O Unerase 6 license key/serial worth $29.95 for FREE. It is a file recovery tool which can be used for recovering your deleted files. I wont be reviewing it here, just the promo details. To grab and download license key, Visit this promo page. You need to provide your Name, email address and subscribe to their email newsletter to get the license key/serial. The license key will arrive in your email Inbox. The email doesn’t arrive instantly. For me it took almost more than 30 minutes for the key to arrive. Grab it before it expires. It valid only till 24th Aug 2010.